Every day we make food choices, and for those of us seeking healthy options often find ourselves tripped up by seemingly safe if not favorable choices, only to find, well, read on..
Men's Health recently exposed unhealthy ingredients lurking in many popular foods, serving up a reminder that we should always read the labels when buying any packaged foods. 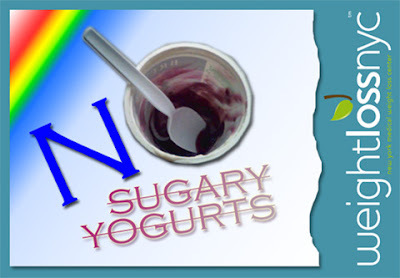 Popular yogurt cups with fruit on the bottom are often really laden with so much sugar negating any real benefit of favoring yogurt for your diet. Consider adding your own fresh fruits to healthier yogurt brands. We're here to help. 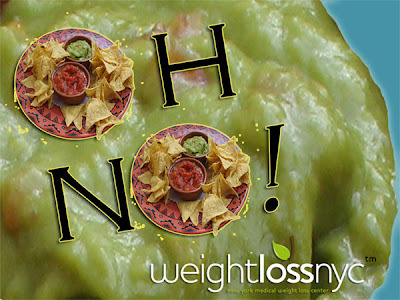 Dr Aron & WeightLossNYC™ staff can help you make smart choices with your diet plan. Consider Antoinette who recently shared with us how her love for her native foods were adapted to suit her weight loss plan. With the spotlight on childhood obesity, many families and schools are trying to address overweight and obesity as school begins. I have heard lots of chatter about what people are planning to do, and I want to share some pointers from recent research and clinical experience. Assess what you eat and drink. A simple way to do this is to write down everything that you eat or drink for a few days. Look at the list and attack the sources of empty calories. The likely offenders are sweet tea, sugared soda, bread, french fries and chips. Dietitians and weight loss programs also recommend writing down what you eat because it makes you think twice before eating. Eliminating junk food may be all that you need to do if you are drinking regular soda, and are eating “nabs” and potato chips. I often hear, “But I don’t eat much of it.” However, the unwelcome truth is that just a little sugar and starch can turn off your body’s ability to lose weight. Some people, I fear, are very sensitive to sugar, and need to get it out of their lives completely. Seek help if you take medication, or if you can’t do it on your own. Some patients tell me that changing what they eat is difficult, even “the hardest thing that that they’ve ever done.” Under medical supervision, medications and “prescription-strength” diets may be necessary to overcome hunger. If you have medical problems like diabetes or high blood pressure, these conditions need to be monitored if you are making a major change in your diet. Have your health measurements checked periodically. While there are many recommendations for “healthy eating,” you cannot know what foods are best for you unless you have certain tests checked by your doctor. I see people who are frustrated because even though they are doing everything that they have been told for general healthiness, they look and feel unhealthy. In many instances, the “general recommendations” are not appropriate for individual people. I have seen “lifestyle therapy” improve or eliminate type 2 diabetes, high blood pressure, high blood cholesterol, sleep apnea, asthma and many other health problems that are so common today. Losing weight is just one step toward a healthier lifestyle. — Oksana Aron, MD, the Director of the WeightLossNYC Medical Weight Loss Center, and a member of the American Society of Bariatric Physicians (www.asbp.org).